God in the Manger – My Traditional Read for December | Portraits of M.E. A few days ago I wrote a post about reading trends – do you or have you read a book more than once? My general answer was “no” with the exception of God in the Manger. Since this was the only book I’ve read multiple times, I thought I would share my reasons behind reading this book each year in December. 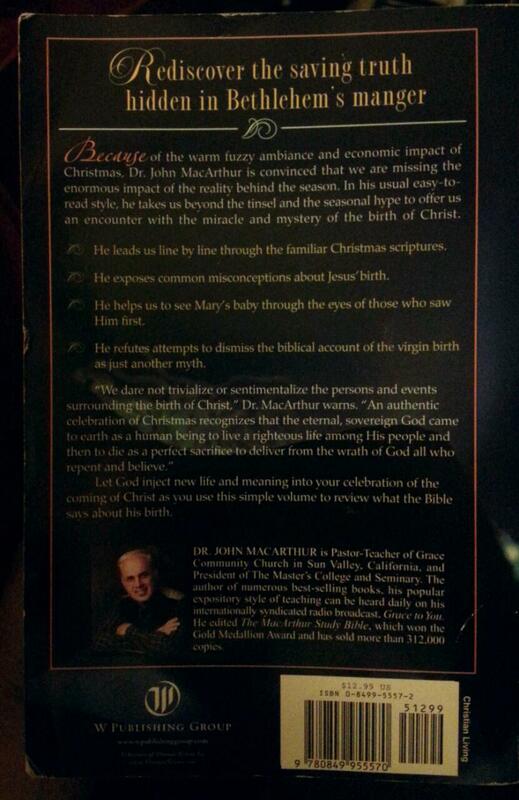 As the title indicates, this book is about Christmas and the birth of Jesus. Being a Christian and believing in Jesus Christ, I find the month of December can get muddled with Christmas traditions and the endless “to do” list we feel we need to accomplish in order to create the perfect holiday season. There’s the gift buying and giving, the baking and cooking, the parties of celebration, and the decorating of the Christmas tree. If you have children it gets even more complicated with the visit to the mall to see Santa Claus, family pictures for the Christmas cards, and buying those cute identical outfits for the kids. None of this stuff is bad, but focusing on all these things can take away from the true meaning of the season and that is why I read God in the Manger each year. It’s a reminder to slow down and appreciate the wonderful gift God has given us in the birth of Christ. Will This News Really Come True? Reading each chapter brings to life the event it focuses on. There is so much information inside each section and this is one of the reasons I like to read this book. It is hard for me to remember all the book describes, so reading it each year helps me remember the extraordinary way God placed the pieces together! John MacArthur, the author, also goes into detail and shares the traditions and the viewpoints of those who lived during that time. That background information is helpful in knowing why certain things happened the way they did. It is truly amazing how each event played into the next until the moment Jesus entered into the world. The back cover – you can tell this book has been read a few times by the rugged looking edges. Reading God in the Manger is also a good reminder of how the events actually occurred in the Bible since some of the movies and books written today distort the story or even remove parts of it in order for it to fit in the 2 hour movie timeframe. Seeing what Hollywood has created can sometimes overtake what the Bible actually describes and subconsciously we tend to take their version over the version in the Bible. The author also references multiple Bible verses to support the commentary he shares. So if you have one, keep a Bible handy and use it as a reference when these verses are mentioned throughout the text.